The first Olympiad was held in 1960 in Turin , Италия and from the second in 1964, the two events (Open & Women) have practically the same format as in nowadays. A third series, reserved for senior players (55 or older) was introduced in 2000. The World Bridge Games were formerly known as the World Teams Olympiad. The event became the World Bridge Games in 2008 when it was held as part of the World Mind Sport Games in Beijing. The event comprises Open, Women's and Senior Teams Championships for National Teams with one team from each WBF Member Country being invited to participate in each of the three series. This contest, the oldest WBF Championship, grew out of private initiatives principally by the late Norman Bach . 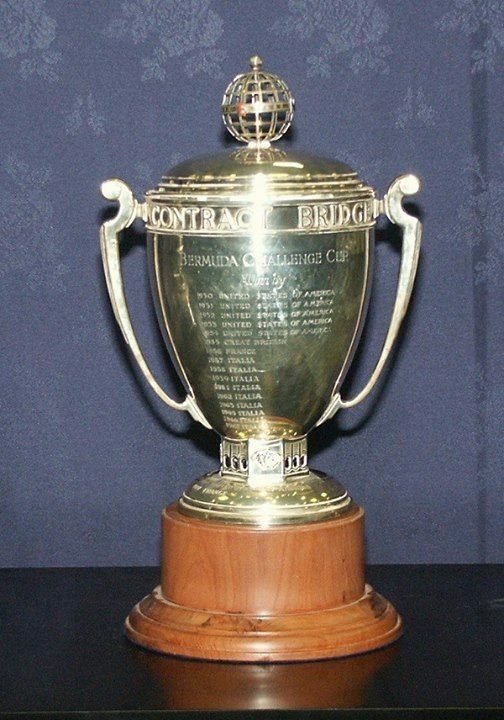 The first world championship for the Bermuda Bowl was held in 1950, in Bermuda, eight years before the World Bridge Federation itself was formed. After the first event of the series, the Bermuda Bowl developed into a regular challenge match between the США and the winners of the European Championship, but in 1957 the contest widened to included teams representing other zones of the WBF. In 1974, in Venice, Италия, a new event was launched, the Venice Cup. It started as a challenge match between women teams from США and Италия - Europe 's representative - and today it is the equivalent of Bermuda Bowl for women, organized under the same laws and format. A third series, the Senior Bowl, for senior players (at least 55 years old, at that time) was added in 2001. The World Team Championships are contested every odd-numbered year. The European Team Championships address all European countries who are invited to participate with their representative (national) team. The format of the championships is a round-robin, whereby each participating team meets every other team in a head-to-head match. There are no qualifying and final stages; at the end of the round-robin, the team with most points is the tournament winner, and the country it represents is crowned 'European Champion' for the particular year. The European Team Championships were the first international competition to be established in Europe. It was launched in 1932 in Scheveningen, The Нидерланды, and was conducted under the auspices of the International Bridge League (IBL), the forerunner of the World Bridge Federation. The IBF organized all prewar European championships. The competition ceased during the war, and was re-established in 1948, under the European Bridge League (EBL) which had replaced IBL in the mean time. All European championships ever since have been conducted by the EBL. Originally established as an annual event played in one series only (open, i.e. allowing teams of any composition), the European Team Championships had a women series added in 1935. To support the World Team Olympiad, in 1960 it was decided not to hold European Team Championships in the leap years. In 1975, the competition became biennial, held every odd-numbered year. Later on (1995), a senior series was introduced, for players of 55 years or older. Finally, the European Team Championship was moved to even-numbered years as from 2002, to make room for the new competition, the European Open Championships. The European Team Championships also act as the qualifier for the World (Zonal) Team Championships (Bermuda Bowl and Venice Cup), whereby the top teams in the open and women series qualify to represent Europe in the interzonal team competition.